After being sick for the last three weeks since I got back from New York, I am finally starting to feel back to normal! 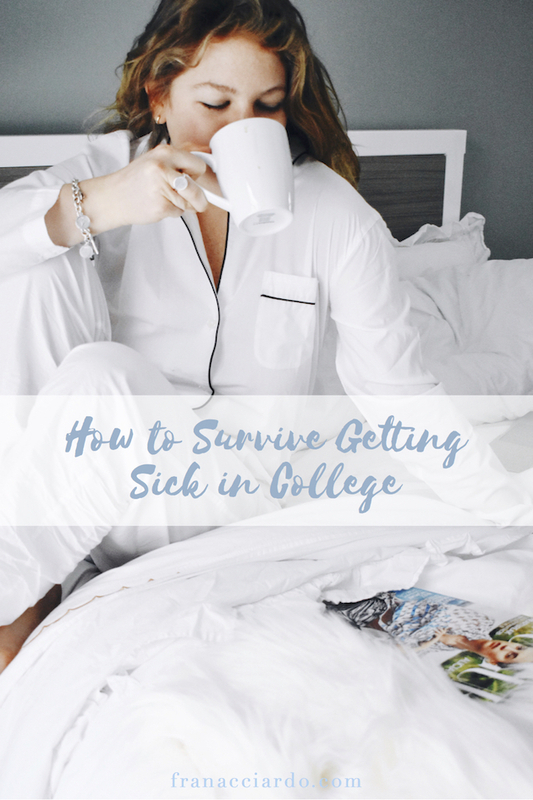 I don't get sick often, but I have definitely gotten sick more in college than I did in high school, and it all boils down to learning how to take care of yourself. Understandably, it's harder to do that on your own than when you're living at home with your parents, so today I wanted to share some of the things I've learned that are most important to staying healthy in college. Fuel Your Body + Stay Hydrated // Between drinking enough water, getting in enough fresh fruits and vegetables, and trying to keep yourself satisfied all day long, giving your body what it needs in college goes much further than just saying, "oh, I'll eat healthy today." In fact, treating your body right can be really hard. I mean, if I forget just a few essentials at the grocery store I feel like I have nothing to make for real meals and I'm totally at a loss for what to eat. It's so easy to get sick when you're dehydrated, or your body is running low in nutrient stores. Try to keep a grocery list of things you always want in your pantry and fridge, and even try meal prepping/planning to make sure you're eating a well-balanced variety of foods. Keep a Clean Routine // I'll be the first to admit that I overestimated my domestic capabilities before coming to college. Yes, I can cook a really great dinner for myself, but when it comes to doing laundry, cleaning the kitchen, cleaning a bathroom, and changing out my hand towels as often as I should, I really fall short. It is so easy to get sick when you're going out every night and coming home in dirty clothes with makeup on, falling asleep in your bed, and then sleeping in those sheets night after night, using the same towels, etc. I have been working on some of these things in my own apartment, and my routine includes changing out my hand towel in the bathroom as soon as I start seeing makeup/dirt marks, only using my shower towel 2-3 times, and changing my pillowcases at least once a week. As for sheets, if anyone else sleeps in my bed besides just me (like a friend visits or sleeps over-- don't get any ideas ;) I try to change the sheets the very next day. If not, then I usually change them every week or other week depending on how dirty I feel like they are. Get Enough Fresh Air + Activity // I finish classes everyday at noon, and since it's been cold out, there have been quite a few days where I come home after class and don't leave my apartment until I have to go to class the next day. Sitting around on my couch and being lazy does nothing for my body, so I try to find something to do each afternoon to at least get outside and do something. Whether it be an extra trip to the grocery store, going to the library, meeting a friend for coffee, or just roaming around campus (that's really hypothetical... being totally honest, I would never leave my apartment just to walk around campus in the cold HAHA) it's important do to something to get moving. Get Enough Sleep // This one is easier said than done for a lot of people. I've been lucky this year that my academic course load hasn't been too stressful. That said, I go to bed by 11PM every night and at minimum get in my eight hours of sleep everyday. I have noticed this has really made me feel brighter and more energized, and it's so essential to keeping our body running at it's best. If you can find time to remove distractions and unnecessary phone/Netflix time, it is so possible to have productive days so you can have relaxing nights and get the sleep you need. What are your tips to staying healthy in college? I always forget to change my towels and sheets too! This year I have gotten into a pretty good routine of washing them every weekend, but it can be so easy to forget! definitely agree with you! just a habit i need to solidify, i guess!! Love these tips, Frannie! I'm in the dorms this year and it seems like you can't escape getting sick haha!